If you’ve been following automotive news from the country lately, you would be aware of the facelifted Etios Platinum being launched. No, it’s not significantly new, although the company wants you to believe it is. 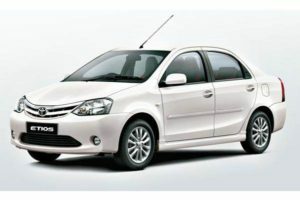 This is the fourth update to the Etios range in last five years or so, which could mean two things – Etios is a hotbed for new technology introduction or else the model just hasn’t been able to convince enough potential customers. The latter reason, as most of you would know seems more realistic. The interiors of the new Etios are undoubtedly a notch above the outgoing one. The earlier version was unusually equipped with instrument binnacle placed on the top of the centre console. It was annoying for many people as they cannot see the information without road distraction. Though the new one also gets the same unit, they now feature semi-digital combi-meter display for the convenience of the driver. The car gets new black-ivory colour scheme while the styling of the rest of the dashboard remains identical to the outgoing version. The large windows and the beige upholstery inside makes the cabin looks bigger and roomier. The sedan is a proper 5-seater and the legroom is amongst the best you can have under Rs. 10 lakh car. The seats are large and comfortable while one will also notice the alteration in the texture of the seat fabric. However, the use of rough plastic, especially the bottom of the dashboard seems to be really out of place. The carmaker has added a central armrest for more comfort. But, the addition of features such as automatic climate control, multi-information display and rear ac vents would have really boosted its image among the class. Among the plus points of the car, ingress and outgress is amazing while the height adjust functionality and tilt-adjustable steering making the driving position more comfortable. The storage space is also abundant with plenty of cubby holes and bottle holders across the cabin. The infotainment system is still limited to the 2-Din audio system with Bluetooth and USB which is again a disadvantage given the budget cars are also coming up with touchscreen units. The engines remain unchanged on the cars as the familiar 1.5 L petrol and 1.4 L diesel engines continue to power the Etios. Toyota did consider an AMT but found it to be less reliable and high on maintenance. A torque convertor automatic would’ve pushed the cost beyond the competitive zone so that wasn’t used either. Hence, the transmission too remains unchanged, bringing about almost no difference to the way the Etios Platinum would drive viz-a-viz the outgoing version. There have been some changes made to the suspension tuning but we can’t comment on the difference it makes till we drive the vehicle. The company claims that it has worked upon the shock absorbers. While the ride quality is undoubtedly very good but isn’t different as compared to the earlier version. However, as the suspension has been tuned, one can expect a slight slandering into the corners. The car never feels less composed and remains stable regardless of the road conditions. The steering also feels nice and comfortable to operate. The performance of ABS+EBD brakes is confident and performs just as expected. One of the biggest talking points of the car in this version is the updates in the safety department. The sedan now comes equipped with dual front airbags, ABS with EBD, ISOFIX mounts, keyless entry and driver seat belt warning as standard features. Move on to the top variants and you also get front fog lamps and reverse parking sensors. The carmaker has also reinforced the chassis so that it could perform better in case of crash.